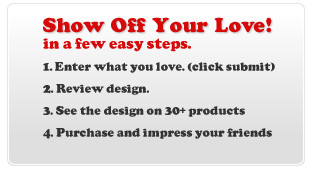 Order your own custom love shirt in just a few easy steps. Follow the steps outlined above to order your own custom heart shirt. Our shirts usually ship in 1-2 business days. Please note that orders will be reviewed to make sure that they do have any trademark or copyright infringements. Please do not make cusotm heart shirts with celebrity names, company names or your order may be refused after our review of your custom order. If you have questions about designs submitted by customers that may be a violation of copyright or trademark please contact us and we will review it as soon as we can. Thanks for making ihearttees.com the top choice for shirts with love.